Modelithics has just released new version of its COMPLETE Library software for use with the Keysight Genesys software. Version 18.2 includes 24 new models, and offers compatibility with the latest Keysight Genesys software release, playing a key role in the new Genesys rapid design optimization tool, Vendor Parts Synthesis (VPS). 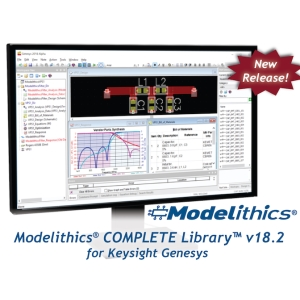 The Modelithics COMPLETE Library, v18.2 for Keysight Genesys, which has been coordinated with timing of the latest Genesys software release, is now available. Designers will have access to an exciting new tool in Genesys called VPS, that utilizes the scalability features of Modelithics Microwave Global Models™ to advance from an optimized ideal design, to a final buildable design, including effects of layout and “real-world” component parasitics, that still meets the original design specs. A free sample of the Modelithics Library, Modelithics SELECT+ with 18 models, is now included with all Genesys 2018 installations to make it easy to evaluate this new efficient synthesis-based design flow. The new version of Genesys has now also incorporated functionality of Modelithics Microwave Global Model dynamic pads. Previously, pad scaling was available, but it only applied to the simulation. Now, if pad dimensions are changed, the pads in the layout adjust accordingly to enable accurate EM-circuit co-simulation. Discrete optimization is another new feature that is available. The optimization process during VPS includes a discrete optimization using the available vendor values included in Modelithics models. The v18.2 Modelithics COMPLETE Library contains over 540 models from more than 50 vendors, representing over 16,000 total components. New models include those for capacitor series from AVX, Murata, Passive Plus, Presidio and Samsung, inductor series from Coilcraft, TDK and Würth Elektronik, and a resistor series from ATC. Along with the v18.2 release of the COMPLETE Library, the Modelithics mmWave & 5G library for Keysight Genesys is also available. Introduced in 2018, the mmWave & 5G Library contains all models that are validated to at least 30 GHz, with some validated as high as 125 GHz! This collection has been designed for the growing area of wireless design within the recently approved mmWave 5G frequencies. For more information about this new release or to request a free trial, click here.